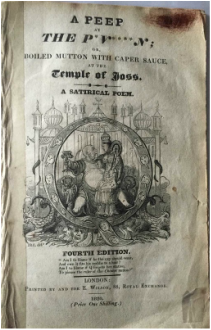 ​Published in London, England : by Smyth & Yerworth, 1880. With 57 pages, numerous illustrations within the 12 pages to the back with both ads and illustrations, In original light blue paper wraps. Title to front covers, in a decorated black border. Ad to the back covers for The Iron Mountain Route to Texas. The booklet is in fine condition with all its original pages intact, no other copy to be found on the world-wide net. at the Temple of Joss. 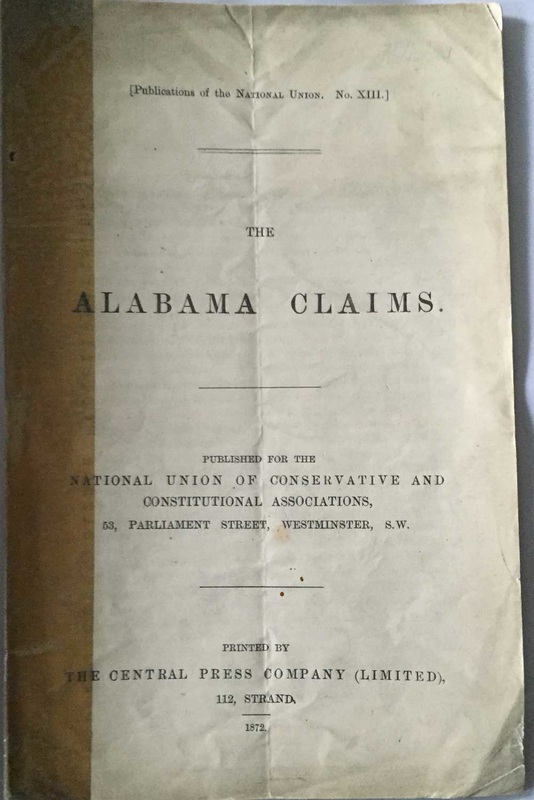 “The Alabama Claims” Published by National Union of Conservative and Constitutional Associations ; Westminster, S.W. (London) Printed by The Central Press Company Strand, London 1872. 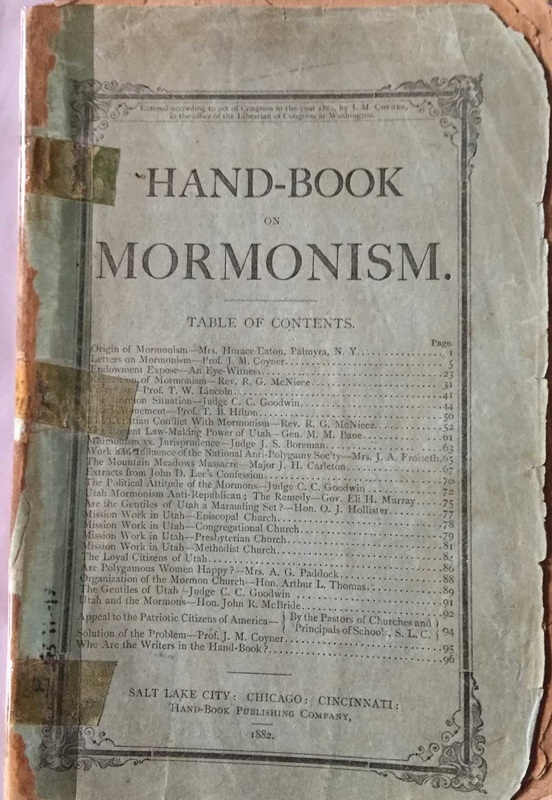 Original Pamphlet, with title page to front and blank page to the back of this 9 page Pamphlet. Original Sellotape along the spine. Scarce/Rare. The Alabama Claims were a series of demands for damages sought by the government of the United States from the United Kingdom in 1869, for the attacks upon Union merchant ships by Confederate Navy commerce raiders built in British shipyards during the American Civil War. The claims focused chiefly on the most famous of these raiders, the CSS Alabama, which took more than sixty prizes before she was sunk off the French coast in 1864. After international arbitration endorsed the American position in 1872, Britain settled the matter by paying the United States $15.5 million, ending the dispute and leading to a treaty that restored friendly relations between Britain and the United States. That international arbitration established a precedent, and the case aroused interest in codifying public international law. The Alabama claims 1862-1872 were a diplomatic dispute between the United States and Great Britain that arose out of the U.S. Civil War. The peaceful resolution of these claims seven years after the war ended set an important precedent for solving serious international disputes through arbitration, and laid the foundation for greatly improved relations between Britain and the United States. Monotheism has been defined as the belief in the existence of one god or in the oneness of God. The Oxford Dictionary of the Christian Church gives a more restricted definition: "belief in one personal and transcendent God", as opposed to polytheism and pantheism. A distinction may be made between exclusive monotheism, and both inclusive monotheism and pluriform (panentheistic) monotheism which, while recognising many distinct gods, postulate some underlying unity. Monotheism is distinguished from henotheism, a religious system in which the believer worships one god without denying that others may worship different gods with equal validity, and monolatrism, the recognition of the existence of many gods but with the consistent worship of only one deity. Judaism is one of the oldest monotheistic religions in the world. God in Judaism is strictly monotheistic,] an absolute one, indivisible, and incomparable being who is the ultimate cause of all existence. The Babylonian Talmud references other, "foreign gods" as non-existent entities to whom humans mistakenly ascribe reality and power. Von nicht confessionellen Standpunkt aus betrachtet. 1st.German Edition Pamphlet by W. Marr, in Original light blue paper wraps. Titels in a red border, with original sellotape along the spine. Friedrich Wilhelm Adolph Marr was a German agitator and publicist, who popularised the term "antisemitism" 1881. Marr's speeches and articles showed first indications of antisemitism in 1848. He was influenced by the Burschenschaft movement of the early nineteenth century, which developed out of frustration among German students with the failure of the Congress of Vienna to create a unified state out of all the territories inhabited by the German people. 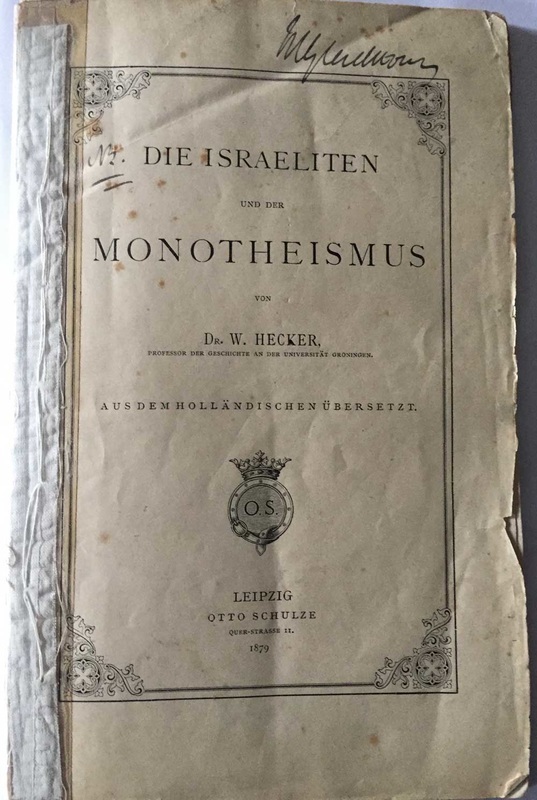 The latter rejected the participation of Jewish and other non-German minorities as members, "unless they prove that they are anxious to develop within themselves a Christian-German spirit" (a decision of the "Burschenschaft Congress of 1818"). While they were opposed to the participation of Jews in their movement, like Heinrich von Treitschke later, they did allow the possibility of the Jewish (and other) minorities to participate in the German state if they were to abandon all signs of ethnic and religious distinctiveness and assimilate into the German Volk. Marr took these philosophies one step further by rejecting the premise of assimilation as a means for Jews to become Germans. 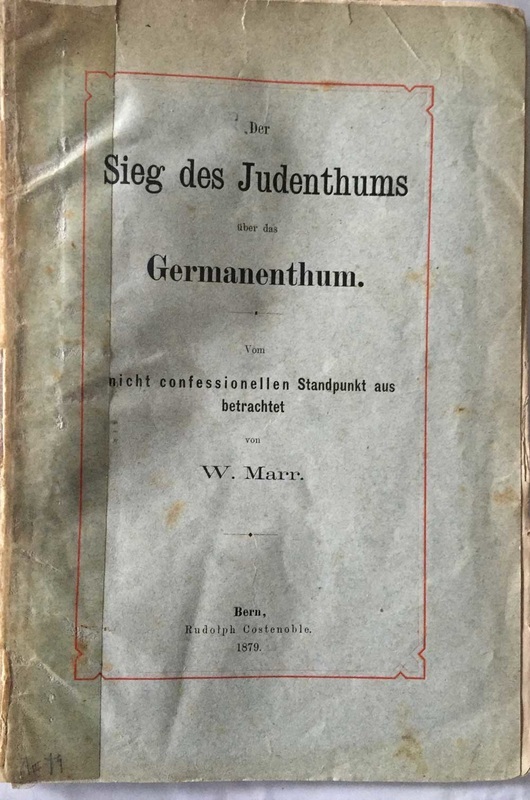 In his pamphlet Der Weg zum Siege des Germanenthums über das Judenthum (The Way to Victory of Germanism over Judaism, 1879) he introduced the idea that Germans and Jews were locked in a longstanding conflict, the origins of which he attributed to race—and that the Jews were winning. He argued that Jewish emancipation resulting from German liberalism had allowed the Jews to control German finance and industry. Furthermore, since this conflict was based on the different qualities of the Jewish and German races, it could not be resolved even by the total assimilation of the Jewish population. According to him, the struggle between Jews and Germans would only be resolved by the victory of one and the ultimate death of the other. A Jewish victory, he concluded, would result in finis Germaniae (the end of the German people). To prevent this from happening, in 1879 Marr founded the League of Antisemites (Antisemiten-Liga), the first German organisation committed specifically to combating the alleged threat to Germany posed by the Jews and advocating their forced removal from the country. Worn, a few slight nicks and tears, some age browning as to be expected, a few old pencil notes throughout the 50 pages, otherwise a good copy of an original 1st.German Edition Pamphlet by W. Marr. Scarce/Rare. 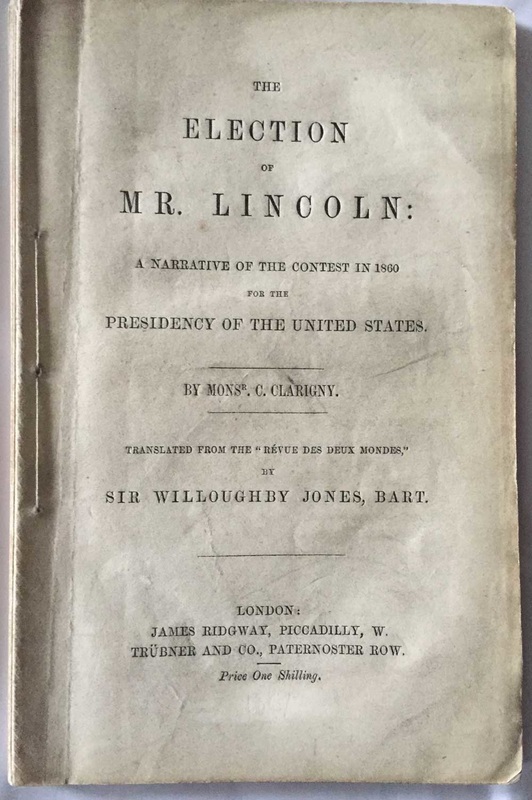 The Election of Mr. Lincoln: a Narrative of the contest in i860 for the Presidency of the United States, by Monsr. C. Clarigny. Translated from the " Revue des deux Mondes," by Sir Willoughby Jones, Bart. London : Published by James Ridgeway, Piccadilly, W. Trubner and Co., Paternoster Row. 1861. Price one shilling. 8vo,- 91pages. Author's full name, Phillipe Athanase Cuchival-Clarigny. 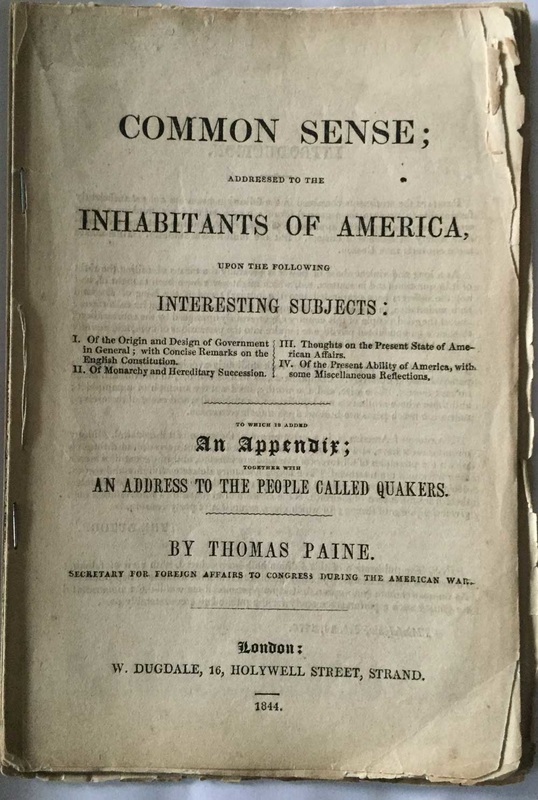 Original 1st.English Edition Pamphlet, with title in black lettering to the very front page, blank back page. 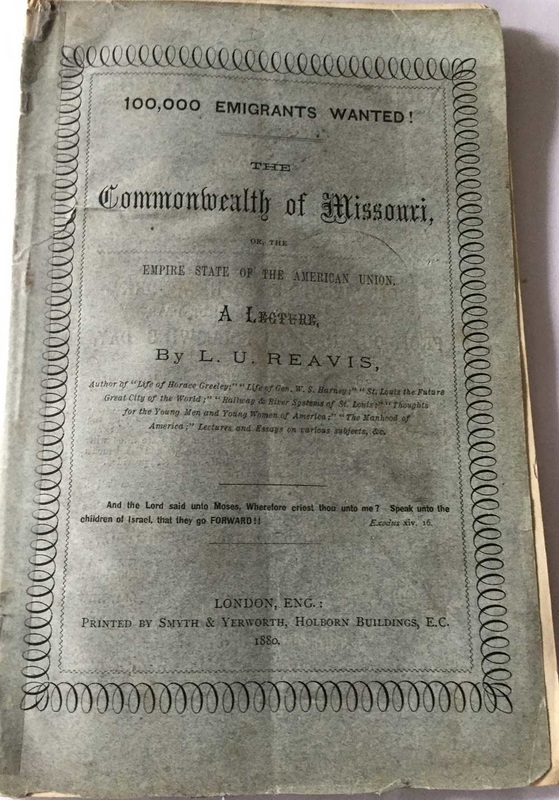 In very fine condition considering the Pamphlet age, 1860 printing. A few old pencil notes and underlining lines throughout the 91pages. Subjects of Pamphlet, Abraham Lincoln’s changing views on slavery. ​Abraham Lincoln was the 16th President of the United States, serving from March 1861 until his assassination in April 1865. Lincoln led the United States through its Civil War—its bloodiest war and its greatest moral, constitutional, and political crisis. In doing so, he preserved the Union, abolished slavery, strengthened the federal government, and modernised the economy. Abraham Lincoln was elected president in 1860. Lincoln's victory prompted seven southern slave states to form the Confederate States of America before he moved into the White House in 1861. Abraham Lincoln's position on slavery is one of the central issues in American history. Abraham Lincoln often expressed moral opposition to slavery in public and private.Initially, he expected to bring about the eventual extinction of slavery by stopping its further expansion into any U.S. territory, and by proposing compensated emancipation (an offer Congress applied to Washington, D.C.) in his early presidency. Lincoln stood by the Republican Party's platform of 1860, which stated that slavery should not be allowed to expand into any more territories. Lincoln believed that the extension of slavery in the South, Mid-west, and Western lands would inhibit "free labor on free soil". In the 1850s, Lincoln was politically attacked as an abolitionist, but he did not consider himself one; he did not call for the immediate end of slavery everywhere in the U.S. until the proposed 13th Amendment became part of his party platform for the 1864 election. This 1860 pamphlet of Abraham Lincoln is very Scarce and Rare, no other copy to be found on the world-wide web, only modern reprints. ​An original 1st. 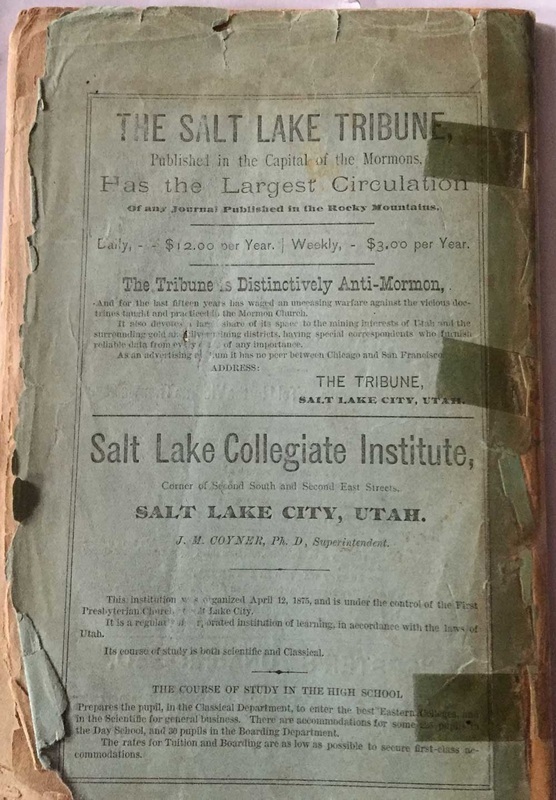 Edition, green Pamphlet;-Published by Salt Lake City, Chicago, Cincinnati: Hand-Book Publishing Co., 1882.